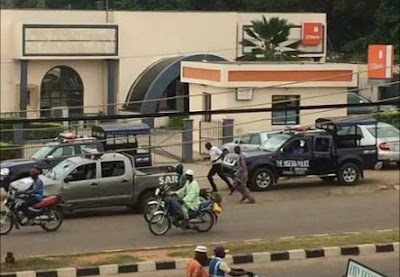 The information reaching Kwarareporters have it that arm robbers are currently operating in Guarantee Trust Bank at Unity area of Ilorin. According to our correspondent who visited the scene where the robbery was said to be taken place have it that the news is untrue. After brief interview with the police officers who stationed their vehicles at the front of the Bank. The team most superior officer said "It is a fake news nothing like that is happening here though we had about the news but as you can see there is nothing like robbery going on here".